The eagled-eyed among you may be aware that Team Who What Wear UK actually gave you a sneak Instagram-based peek into the world of Mulberry's magical S/S 18 collection a few months ago when were whisked off to Paris for a private preview. It was all very exciting—the brand had decided to shift gears and move to a see-now, buy-now strategy, which means the pieces you're about to look at below (and probably fall a little bit in love with) are actually available to shop already. Fresh, fun, fit for a fancy party and so fantastic on KiraKira+, designer Johnny Coca's elaborate, decadent, '80s-tinged Beyond Heritage collection offered up plenty to get the fashion crowds reaching for their phones. Set against a mirrored dreamscape within the confines of Mayfair's Spencer House (where the brand is hosting a weekend-long affair of presentations and workshops to celebrate the launch), jewel-smattered satin frocks, flamboyant hats, candy-striped separates, porcelain-heeled shoes and frilly knits took to the runway. Of course, as is the nature of the label, the bags were equally interesting—with two new styles in particular capturing our attention. Keep scrolling to see all the details from the line and to find out what we'll be buying (as soon as we stop typing). Taking his cue from antiques (see the Wedgewood-esque prints and faux-porcelain vase heel details) as well as the idea of dressing up for an important party, there was nothing shy and retiring about Coca's outlook for spring 2018. 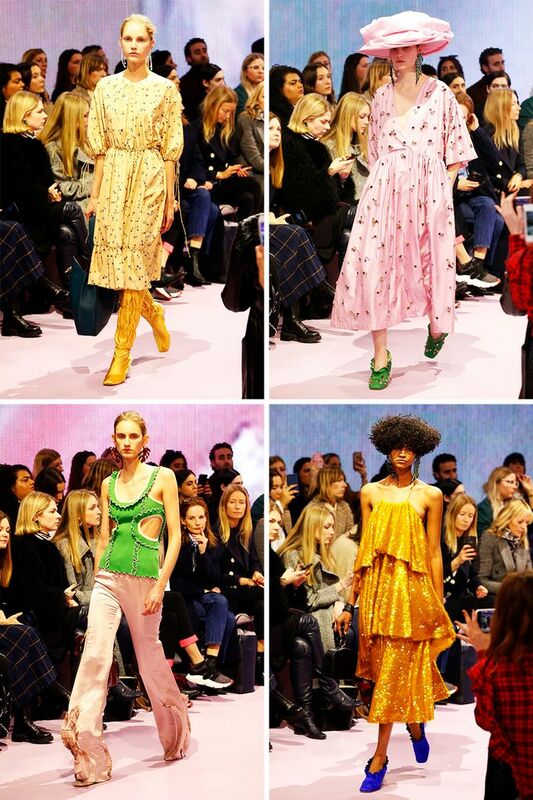 Although it was easy to get carried away with Boomerangs of the amazing hats and exaggerated shapes, we did earmark the more commercial takes on his vision, like a soft, pink gauzy blouse, a pea-green trouser suit and the ribbed, ruffle-edged knits. Introducing Marloes and Lynton—the former a natty little retro-looking satchel bag with a chain strap and a circular gold-ring clasp, the other a more frivolous drawstring pouch rendered in leather and occasionally covered in multicoloured stones. Many girls at the show were proudly carrying their Amberley satchels, so the Marloes is a natural successor to the throne. But something tells us—in the age of Instagram and a growing love for silly mini bags—that the Lynton will provide stiff competition. We couldn't round out this story without giving a big seal of approval to one more very important thing. Johnny's jewels! From surreal face earrings made to look like sparkling mobiles through to a bird brooch that will make your day-to-day wardrobe a hundred times more interesting, we may even be persuaded to swap shoes and bags for bling this season… Okay, wait, we want a pair of the shoes too.